Hola nuestros amigos catalanes, acabo de conseguirme un cierto " " de Bactohemp; y la información sobre línea es limitada. ¿Me preguntaba si cualquiera de usted los cultivadores la han utilizado? Cualquier información sería llena mucho grande. Sorry i dont speak spanish, wish i did. 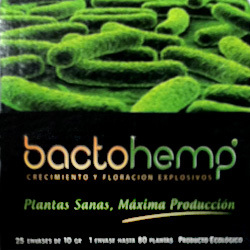 Hello our Catalan friends, I have just got myself some " Bactohemp " and the information on line is limited. I was wondering if any of you growers have used it ? Any information would be much great full. Paso del soplo del soplo Puffpuffpass. Then what you should have responded with was..."Pardon me diddley, but I am British"
LOL ik sprekt ook nerderlands maar dat is niet zo goede here toch. As i was in spain i asked for thrichoderma and the guy said out of stock try bactohemp , it was 5 euros so i got a 10g bottle. In any culture is vital to life micobiana the ground, but when grown in pots or containers that need is pressing, with Bactohemp provide a living soil to our plants. The symbiosis formed between plant roots and certain soil fungi called mycorrhizae (fungus + root =). These fungi provide the plant with more and better access to nutrients and water available in the soil due to its extended mycelium (= hyphae, fungal filaments very long and thin to grow in the ground). This improvement was partly explained by the spatial extent and the increase of the interface that form the mycelium. . In return the plant provides the fungus with energy and all substances derived from photosynthesis (carbon in the form of sugars). As each partner takes advantage of the other's action, the symbiosis is beneficial. Mycorrhizal fungi are ubiquitous in the environment, all types of soils throughout the world. With very few exceptions (some tree species, Brassicaceae), almost all species of plants can form mycorrhizae. Mushrooms are produced by endo-mycorrhizal MYCOSYM, also called "Arbuscular Mycorrhiza" (AM) penetrate living cells in the cortex of the root, and require the acceptance of a host plant for reproduction possible. Do you use any benifical fungus Diddley ? K thanx Diddley , yeah i've always used some kind of zyme but stopped since i use thricoderma as enzymes eat them. LOL rich ! am far from rich, i have to go halfs with a mate to get a mns strain. £10 for a small 10g bottle and i've used just 2 teaspoons , 1g to 4liters of water which they say is good for 30 plants. Ahh so you are coco , well am hydro and would hope to end up on the coco road. Bactohemp was only 5 euros :eek: i wont use it untill i found some others who have. To be honest Diddley i've used HESI ferts for 5 yrs , veg flower zyme rootboost and supervit and it has always been good to my plants and the last run i used trichoderma and noticed the explosion in roots. i don't know what type of chemicals you can get at the hardware store, but the here they sell pond enzymes that are the same as the nitro/hygrozymes. A lot more concentrated and 1/4 of the price. also good coco should be have trichodermia in it and is a great medium to grow trich.